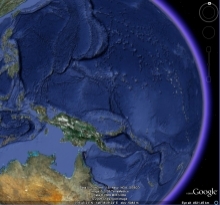 The GEBCO_08 Grid, GEBCO's recently released 30 arc-second global bathymetric grid, has been used in Google Earth 5.0 as a foundation layer for its global 3D model showing the shape of the seafloor. The grid has been developed by combining quality-controlled ship-track soundings with interpolation between the soundings guided by satellite-derived gravity data. Find out more about GEBCO's gridded bathymetric data sets and how to access the GEBCO_08 Grid. A recent scientific cruise in the South Pacific Ocean has reported that "Sandy Island" does not exist. Strange features on the ocean floor? The 'mystery' is explained. Find out more about the GEBCO_08 Grid and how it was developed.